Broadcast quality playout automation solution. Composite card and software. DV type 2 (720x576), 4:2:0, compression 1:5, 32/44/48 KHz stereo audio - no 4 GB limit AVI file produced by most non-linear editing cards supporting the DV format. MJPEG (720x576), 4:2:2, compression up to 1:3, 32/44/48 KHz stereo audio - format produced by miroVideo DC30/DC50, Matrox DigiSuite/DigiSuite LE, Fast AVMaster cards. 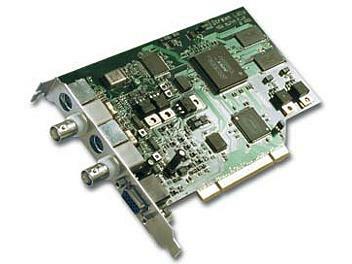 DivX, MP-4 (720x576), 4:2:0, bandwidth up to 10 Mbps, 32/44/48 KHz stereo audio - no 4 GB limit AVI file produced by the DivX codec or its analogues in compliance with the MP-4 specification. MP-2 (720x576, 704x576, 512x576), 4:2:0, bandwidth up to 10 Mbps, 48 KHz stereo audio - MP-2 Main Profile file (compatible with DVB, Digital Video standards and most hardware coding devices in MP-2). MP-2 I-frame (720x576), 4:2:2, 32/44/48 KHz stereo audio (or in a separate WAV file) - no 4 GB limit AVI file produced by Matrox cards, series RT-xxxx. Alpha Pro SC files - standard script files of the popular Alpha Pro AE v.2.0 character-generating software.